Here's a riddle: What's the worst thing that can happen when you buy $82,000 worth of iPhones, arrange them in a heart and have all your closest friends stand around you and your beloved while you propose with flowers? She can say hell no! And it can all be caught on video. Even back in 2010, it might have been cute to film a public proposal. Flash mobs were new, dancing wedding entrances were still hot and everyone was drunk off the heady mixture of internet, taking video with phones and the quest for 15 minutes of fame. Those times, however, are over, and now the only people whose proposals make the FAME AND FORTUNE cut are the ones whose antics are either very clever or very, very painful. And this time? It's all sorts of painful. Like so painful that I literally winced when I read this article and my body is still tingling with second-hand embarrassment. 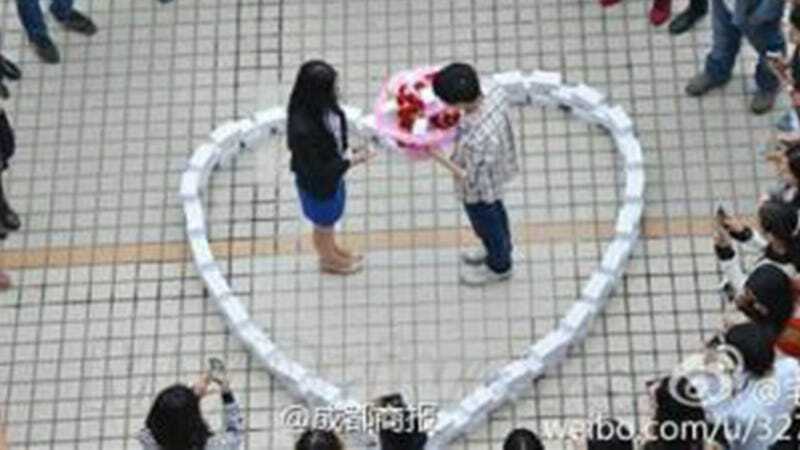 So here's what happened: A programmer in China, apparently fearful of Singles Day (it is tomorrow; 11/11) rounded up 99 iPhones [Obligatory "99 Problems" reference here]and asked his girlfriend to marry him so that the couple would never have to spend 11/11 alone again. Unfortunately, while their friends surrounded them and took photos, the horror-stricken bride-to-be said no. And that's pretty much the worst thing that will ever happen to this guy. But what else was he really expecting? And what is the significance of all of those iPhones? If my partner proposed to me with cold hunks of metal and plastic laid out in a heart, I would probably also run. I mean, even if the point was "I can provide for you," I would still be concerned that he had sunk all that money into already-on-the-way-to-obsolete pieces of electronic equipment instead of investing his money into some reliable stock.